Value Research online is an online website that offers unbiased investment advice, analysis and information about Mutual Funds, Stocks and fixed income investment options. Value Research online make use of sources such as expert opinion, fact sheet, and data available online. They study portfolio of Mutual Funds, check credentials of fund manager and history of the fund house before recommending mutual funds. Value Research Online is popular for providing performance ranking to mutual funds. The rating provided by Value Research Online is also known as VRO Star Rating. In addition to star rating Value Research Online also provide risk grade and return grade. Highest rating given by value research is five stars. A five-star rating is given to mutual funds only when a team of value research is highly satisfied with fund performance & fund is likely to deliver better returns in the future. This is the primary reason people invest in five-star funds. There are multiple types of mutual funds such as regular growth, regular dividend, ELSS, ETF, Direct Growth, Direct Dividend, and NFO. 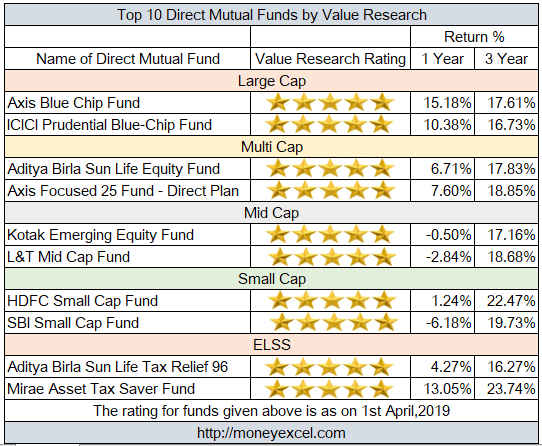 If you are Do Yourself Investor (DIY) and looking for a good fund for the investment you should look at Five Star rated Direct Mutual Funds by Value Research Online. Fund Objective – The primary objective of this fund is to generate long term capital growth by investing in a diversified portfolio consisting of equity and equity related instruments of large-cap companies. Why to Invest – Historically Axis Blue Chip Fund Direct Growth plan has given very good returns to the investor in the past. In the last five years, this fund has generated 15.68% returns. The expense ratio of this fund is very low. It is five star rated fund by VRO. Risk grade of this fund is low and Return grade is above average. Fund Objective – This fund aims to generate long term capital appreciation and income distribution to investors from a portfolio. This fund invests in equity and equity related instrument from large cap segment. Why to Invest – ICICI Prudential Blue-Chip Fund has historically generated very good returns for the investors. Last five year returns of this fund is 15.39%. This fund is managed by an experienced fund manager. Risk grade of this fund is low & Return grade is above average. Fund Objective – The scheme seeks to generate long-term capital appreciation from a portfolio of equity and equity-related securities, by investing predominantly in mid companies. Why to Invest – Kotak Emerging Equity Fund has generated 19.07% return since launch. In last five years this fund has generated 23.86% returns (As on April 2019). The expense ratio of this fund is very low. Risk grade of this fund is below average and return grade is high. It is five star rated fund by value research online. Fund Objective – This fund generates capital appreciation by investing in mid cap stocks. The scheme invests in companies whose market capitalization between a highest and lowest constituent of Nifty Float Midcap 100 Index. Why to Invest – This fund is managed by an experienced fund manager. The expense ratio of this fund is low. This fund has given very good return since last few years. Risk Grade of this fund is below average whereas Return grade is high. It is five star rated fund by the value research team. Fund Objective – This fund aims to generate long term capital appreciation by investing in small cap companies. Why to Invest – HDFC Small Cap Fund is five star rated fund. This fund is managed by highly reputed company. This fund has given very good returns to investors in the past. Risk grade of this fund is below average and return grade is above average. Fund Objective – This fund invests mainly in a well-diversified basket of equity stocks of small cap companies with an aim to provide long term growth in capital. Why to Invest – SBI Small Cap Fund is one of the highest return generating fund. This fund has generated 26.53% return since launch. It is five star rated fund. Risk grade of this fund is average and Return grade is high. Fund Objective – This fund aims to generate capital appreciation and regular income via 90% of investment in equities and 10% in debt and money market securities. Why to Invest – This fund has generated very good returns in the past. The portfolio of this fund consists of various blue-chip stocks. It is managed by experienced fund manager. Risk grade of this fund is below average and Return grade is high. Fund Objective – This scheme seek to generate long term capital generation by investing in a concentrated portfolio of equity and equity related instruments up to 25 companies. Why to Invest – Axis Focused 25 Fund is five star rated fund. This fund has generated magnificent returns to the investor in past. The expense ratio of this fund is very low. Top holding of this fund is blue chip companies. Risk grade of this fund is average and Return grade is above average. Fund Objective – The scheme seeks long term capital growth and invest approximately 80% of its asset in equity, while the balance would be invested in debt. Why to Invest – Aditya Birla Sun Life Tax Relief 96 is five star rated ELSS fund. This fund is managed by experience fund manager. This fund has generated very good returns in the past. Risk grade of this fund is below average and Return grade is high. Fund Objective – This fund aims to generate long term capital appreciation from a diversified portfolio of equity and equity related instruments. Why to Invest – Mirae Asset Tax Saver Fund is one of the best funds with five star rating. This fund is a newly launched fund. However, this fund could generate 23.74% return in last three years. The expense ratio of this fund is low. This fund holds very good stocks. Risk grade of this fund is low & Return grade is high. Do you hold any of the Mutual funds given above? What is your take on above Direct Mutual Funds?